Minimum Wage Singapore | Let's Consider: Minimum Wage for Singaporeans? Let’s Consider: Minimum Wage for Singaporeans? Minimum wage has been a point of contention for many. The crux of this idea is to protect low-wage workers and guard exploitation by unscrupulous employers. It sounds like a simple, easy solution to compel all employers to comply with paying a minimum price salary. There exists elderly and transient workers who are paid only several hundred dollars for full time work. Actual numbers are difficult to tally; no one will declare these figures. However, these are usually small companies because any well sized one is under public and union scrutiny. Malaysia has recently introduced a minimum wage of RM$900 – this will be interesting to study in a later to observe impact. Closer to our economy is Hong Kong: which has had introduced minimum wage (of HK$28 per hour, about S$5) for about a year now. If you’re interested in a full-article of how Hong Kong has turned out, have a read at this link (http://www.timeout.com.hk/big-smog/features/50262/the-28-minimum-wage-one-year-on.html). Hong Kong established minimum wage in 2011. Real impact affects the lowest paid industries: competition for workers has increased, because more are attracted to easier work and higher pay – such as security guards. Quote security guard Yu, “Even young people are looking to be a security guard… it is highly competitive in the industry these days”. Manpower has now become a problem. Since wages are now the same, people tend to flock to larger companies where there are more benefits over the wages. Workers now find their workload much heavier because companies now cut the number of workers. Rather than a minimum wage, I’d prefer the National Wages Council to keep a more watchful eye on exploitation of workers; transient or otherwise. Currently, another problem at hand is unrealistic salary expectation – if you are employer, chances are you have experienced this (frequently): Many people price their salaries on their age rather than their experiences, skills or abilities. I sincerely wish that NWC actively promote, take action and consider perhaps setting up whistle-blower channels to alert industry, public and unions about employers who are exploiting manpower. 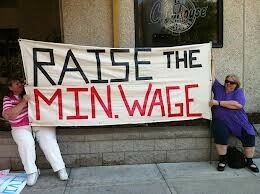 Minimum Wage, I am inclined to believe, is not necessary. If you weigh the pros and cons, this blanket policy is an easy way out. It is more of a populist tool to win votes rather than a genuine interest in helping others. There are far better ways to protect the interests of a few, rather than a blanket policy that will affect all. And this… is what I would support: a flourishing economy, a wide range of jobs, more choices, more opportunities to fulfill ambitions and to keep unemployment rate low. I want to see a society that cultivates more successful, intelligent, thinking Singaporeans who command good salaries. We are people, we are proud of what we do, we have value. We are not commodities on sale. Thanks for writing this article. I will be interested to find out how Malaysia fares in the minimum wage policy immplementation. Singapore’s economic success is based on a few factors such as efficiency, relatively cheap labour, low taxes and low inflation. It is a developed nation with a third world exploitation mentality where the hired help or blue collar jobs are paid relatively low wages compared to their counterparts of developed countries. Fixed living costs in a land scarce and natural resource poor society like ours such as rent, electricity and public transport will continue to rise over time but wages for this social group remains relatively stagnant and doesn’t quite keep pace with the rising cost of living. It is a strange conundrum isn’t it? Whilst your suggestion of setting up whistle blowing channels to monitor manpower exploitation sounds great; in reality, I don’t know how effective it will be as there will always be objections or challenges for people to whistle blow for fear of their own livelihoods over their conscience.